Gdansk’s Shakespeare Theatre is situated on the site of the first Shakespearean theatre to be built outside of England in Shakespeare’s lifetime and has a roof that can open in 3 minutes to enable the players to perform in natural light. As Professor Jerzy Limon, who is one of the main driving forces behind the theatre, and who has been described as the Polish Sam Wanamaker, says, ‘it is out of this world. There is no such theatre in the world. On the one hand it is reminiscent of Renaissance playhouses, but it is also a modern building filled with contemporary technologies’. The roof was unveiled on Shakespeare’s birthday this year, and as Limon explains, Pudzianowski’s attempts initially failed in their choreographed display because ‘Mariusz represents mundane, earthly powers, and so he couldn’t do it. He has to wait for the forces of art to help him, and then he pulls on the rope again and he can do it’. The spectacle thus unleashed looks much like a pyrotechnic (and less rained-out) version of Garrick’s resplendent Pageant at his 1769 Shakespeare Jubilee. Characters from Shakespeare’s plays strut across the roof in beautiful, balletic configuration. Like many of the people behind the Globe project, such as Andrew Gurr, Limon has published a body of academic work inspiring the construction of the theatre. The roots of the theatre lie in the presence in early modern Gdansk of itinerant players from London; their history is detailed in Limon’s book Gentlemen of a Company. Early seventeenth century Gdansk was the Baltic’s biggest city, but though affluent it had hitherto lacked a professional theatre. The first recorded visit from English players was in 1601, and they returned every summer for many decades; Limon compares them to ‘the rock musicians of today…a similar, and earlier, example of British cultural expansion’. 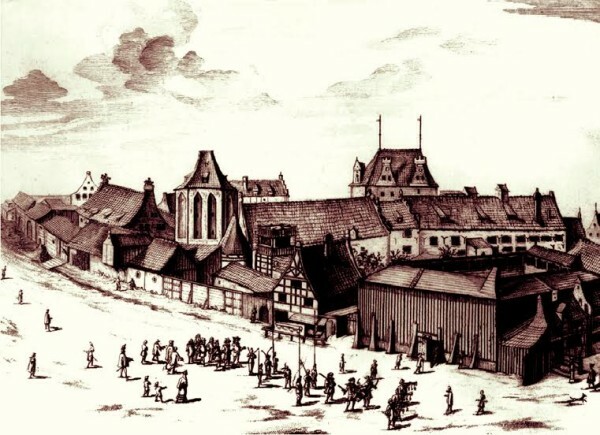 On their third visit, a public building was erected in Gdansk: a wooden structure that served as a theatre and a fencing school, and which enabled the players to replicate the staging conditions at the Globe, the Hope, and similar English Renaissance playhouses. Unfortunately this original playhouse was dismantled in 1741, and was replaced by a new theatre, in English ‘The Comedy House’. This in turn was dismantled in the nineteenth century and the site was converted into a housing estate (now itself demolished). In reconstructing, and modernising the original wooden structure, Limon’s main aim was ‘to revive the English theatrical presence’ in the city. Part of the Teatr Szekspirowski is built on a former carpark – perhaps rivalling the discovery of Richard III’s body as the most exciting thing to happen in a carpark in recent years. The initial planning stages of the theatre began over two decades ago, and coincided with the fall of communism. Limon said he began with high hopes for funding from ‘this new set of open-handed capitalists in a new democracy’. In reality, the search for funding took a long time, but meant that the Teatr Szekspirowski now has several supporters Europe-wide, including their patron Prince of Wales. gives one an insight and recognition into what really justifies appearance as an artistic form and what doesn’t…non-artistic works do not know why they exist in the form given, artistic works know and justify their appearance in the form given, and they cannot be changed or they will be destroyed’. have just finished phase one. We are now entering phase two: filling the theatre with activity’. In the next year, the Teatr Szekspirowski will be home to ‘an international series of events with a strong British presence’, beginning with a new cycle entitled ‘Theatres of Europe’. This cycle will begin with the ‘British Week’ (the week which opens the Gdansk Shakespeare festival), featuring the Globe’s Hamlet and Gecko’s Missing. March will be Flemish Week, and this is followed by Romanian Week, Georgian Week, Spanish Week, ‘and so on, and on…’, hopefully for many decades to come. The theatre will be officially opened on September 19th, marking the start of the Gdansk Shakespeare Festival, which runs until October 5th.